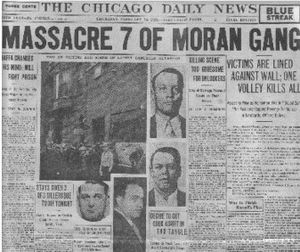 The St. Valentine's Day Massacre was an event which took place on February 14, 1929 in Chicago, Illinois; seven mobsters under crime boss George "Bugs" Moran were gunned down in a garage by men under his chief rival, Al Capone, the culmination of a gang war between the two which lasted several years. On January 16, 1920, the Eighteenth Amendment to the United States Constitution went into effect, whereby the manufacture, sale, and transportation of alcoholic beverages was banned throughout the country. Called "Prohibition" after one of the words in the amendment, it was the result of good intentions by temperance groups who wanted to rid the country of the destructive effects of alcohol consumption, but what they did in fact was to create a lucrative business addition to organized crime, already raking in large amounts of money through prostitution and gambling. In less than a year, speakeasies (clandestine bars and saloons) and illegal breweries would sprout by the thousands in large cities like New York, Chicago, Miami, and Kansas City, while illegal bootlegging and rumrunning (transportation into the country of illegal booze by land and sea, respectively) would keep the cities supplied with stronger liquors. The chief players in the St. Valentine's Day Massacre: Al Capone and Bugs Moran. Chicago in the early 1920s had been established as a haven for the bootlegging industry. Boats would arrive on the Lake Michigan shoreline from Canada bringing whiskey, and trucks would transport barrels of beer from clandestine breweries to speakeasies all over town. Profits from the sale of both would flow into the several gangs in the city who carved out their own swaths of territory, and bribes to corrupt police and city officials guaranteed both would look the other way. In 1925 there were at least ten distinct gangs which had carved out swaths of Chicago territory in one form or another . Problems between gangs - and there were many - would be solved with one of two ways: a handshake or a bullet. Indeed, while several gangs had promised better relations, at least 215 gangland murders were carried out within Cook County at the start of the so-called "Beer War" in 1922 between the Saltis-McErlane gang and Spike O'Donnell's gang up to October, 1926 . By then, there were two clear, powerful rivals: the North Side Gang led by Dion O'Banion, and the Chicago Outfit on the south side, headed by John Torrio. In 1895 a young Giacomo Colosimo found himself in Chicago after emigrating from Italy. Learning from the various street gangs which existed at the time, Colosimo gained a criminal record, as well as knowledge on how to run an organized crime syndicate and grease the palms of the politicians then running Chicago. By 1920, having made millions off prostitution and gambling, he opened his own fancy restaurant, catering to the well-to-do in politics and entertainment. Torrio, at the time Colosimo's right-hand man, had earlier suggested - and ultimately pushed - the idea that the outfit should expand into the illegal booze market. "Big Jim" Colosimo would have none of it; to him booze was a bad vice, and he was rich enough as it was. But Torrio was determined to have his way. On May 11, 1920, Colosimo had entered his restaurant to find two men with revolvers staring him down. One was Frankie Yale, a thug from New York that Colosimo didn't recognize; the other was a portly man whom Torrio had brought in from New York the year before to be the "muscle" in the Outfit: Alphonse Capone. Both fired and killed Colosimo, thus enabling Torrio to head the Outfit and add booze to the operations. Dion O’Banion (or O'Bannion), the head of the North Side Gang, was of Irish-descent. Called “Dean” or “Deanie” by his friends and associates, he had a legitimate side business in a flower shop named Schofield's on North State Street across from the Holy Name Cathedral where he once sang as a choir boy; due to the presence of gangsters his flower shop invariably catered the orders of friends and enemies alike - and invariably for funerals. The floral arrangements that were carried out of Schofield's more often than not cost several thousand dollars each, and in a town like Chicago where there was money to be made (and made under the table), such costs were not unusual. O’Banion also had a quirky side to his personality. Sometimes he was friendly to the point of cheery, and he was just as ready with a gun; at one time he had killed a man for trivial reasons in front of a crowd. It was on purely-religious grounds that he said no to running a brothel, but murder or robbery was always on the table; the Chicago police once credited him with over 25 killings (Newton, 235). But if the police would do anything about him, they couldn't; the pockets of the leading men on the force were filled with O'Banion money. Wanting more control over Chicago’s booze and the speakeasies that sold it, O’Banion entered a deal with Torrio in 1924 over the sale of an illegal brewery. O’Banion had wanted to retire out of the business, or so he claimed, after the sale of the brewery to Torrio. When the deal took place within the building – and the pocketing $500,000 of Torrio's money – the police burst in. Both were arrested, but O’Banion got a week, while Torrio, having a previous record, spent over nine months in prison, all the while listening to the taunts from O'Banion on how he lost half a million dollars. Once out, Torrio intended to be rid of O'Banion once and for all, and left the details to Capone. In November, 1924, mobster and head of Union Siciliano Mike Merlo died unexpectantly, leaving a window of opportunity for Capone. Ordering flowers from O'Banion's place, three men entered on November 9. O'Banion was his usual self in the store, greeting his customers with a smile and holding out his hand, only this time the man held on, not letting go while the remaining two pulled revolvers and fired six shots point-blank. Some evidence indicates a pair known as the “Murder Twins”, John Scalise and Albert Anselmi, were hired by Capone to do the job. His extravagant sendoff to Mount Olive Cemetery (one of the largest gangland funerals in U.S. history) caused a brief cessation in the violence, but the new leader of the Northside Gang, Hymie Weiss, plotted revenge. His first attempt on January 12, 1925, caused the wounding of Capone's driver; the second would take place twelve days later, when Weiss and Moran would show up at Torrio's home and pump bullets into him in his driveway; police sirens, plus the misfiring of Moran's gun as he attempted an execution shot, saved Torrio's life (Newton, 305). But two weeks in the hospital caused Torrio to do a lot of thinking, and he thought it best to stay alive. After he recovered, he deposited the books of his operation into Capone's hands, gave him control of the Southside, and left the country for Sicily. Still, Weiss didn't let up, and on September 20, 1926 he led of caravan of Northsiders to the Hawthorne Hotel in what would be his most spectacular shooting. While Capone and his cronies were having lunch, a barrage of gunfire erupted from the street, causing all inside to hit the floor. The first rounds fired were blanks; nothing was hit in the lobby. As they got up, the real rounds were fired. More than 1,000 rounds of .45 caliber bullets were fired, hitting a bodyguard and a female bystander, and leaving Capone determined to eliminate Weiss. The massacre scene; (top to bottom) Peter Gusenberg (in chair); Albert Weinshank; Adam Heyer; James Clark (against wall); mechanic John May; optometrist Reinhardt Schwimmer (nearly out of picture). The seventh victim, Frank Gusenburg, died in a hospital. "Machine Gun" Jack McGurn and his "blond alibi" Louise Rolfe, at the inquest following the massacre. Plans for a hit on Moran were formulated in early 1929; "Machine Gun" Jack McGurn was given the task for organizing and carrying it out. Instead of using men who might be recognized by Moran's gang, he turned to help from the "Egan's Rats" of St. Louis, Missouri, which included an individual who went by the name of Fred "Killer" Burke. The garage on Clark was watched by McGurn’s men from a rented room across the street, and a car bearing a resemblance to a police vehicle was bought from a used car lot, hidden nearby, and disguised with a police light and siren. To get more information from within Moran’s garage, a shipment of “Old Log Cabin” whiskey was “hijacked”, delivered to the gang, and sold. A short time later, on February 13, a call came to Moran about a similar shipment for 10:30 the next morning, with the request that Moran be there in person to ensure that there would be no trouble. On St. Valentine’s Day, February 14, 1929, the apartment lookouts watched as Moran’s men filtered into the garage; at 10:30, what appeared to be Moran himself arrived - they were told he was a big man who favored brown suits – and they made the call to the gunmen with the fake police car. Four men (some reports state five) climbed into the car and drove to the front of the garage; two got out dressed in police uniforms, entered the garage as if it was a sudden raid, and ordered the men inside to line up against the wall. The remaining men from the car entered bearing Thompson sub-machine guns, while the “cops” pulled out sawed-off shotguns, and all opened fire. Minutes later, after the "cops" departed the scene with their "prisoners", one of them entered the garage and encountered a badly-wounded Frank Gusenburg crawling towards him; his brother Peter Gusenburg was slumped in a chair, while five others lay against the wall. Frank was rushed to the hospital where he lingered for three more hours. The others were identified as Albert Kachellek, also known by the alias of James (or Jimmy) Clark, a German immigrant who had married Moran’s sister and became his second in command; Albert Weinshank, a man who ran several operations for the gang not related to booze; Adam Heyer, Moran’s bookkeeper; John May, an ordinary mechanic whose only association with the gang was to fix their vehicles; and the most curious victim, Dr. Reinhart Schwimmer, an optometrist who apparently liked the thrill of hanging around gang members. He was the big man confused for Moran by McGurn’s men across the street. The garage at 2122 N. Clark Street was torn down in 1967, leaving an empty lot. The bricks where the gang was lined up for their last moment on earth was sold to a Canadian businessman who used them in the washroom of his nightclub. Jack McGurn, the suspected mastermind of the massacre, would himself be gunned down in a Chicago bowling alley on February 14, 1936. The “Murder Twins”, John Scalise and Albert Anselmi, were found dead on a roadside near Hammond, Indiana, on May 8, 1929. A popular story, probably true, was that they had intended to take over Capone’s empire; a banquet in their honor was a setup to end their lives, with Capone himself doing them in with a baseball bat. George Moran, tried as he might, could not restore the gang that was decimated at his garage on Clark Street. Eventually he would return to his roots of petty theft and larceny, a far cry from what he enjoyed in Chicago during Prohibition. Moran was arrested in Ohio in 1946, after robbing a bank messenger of $10,000. Sentenced to Leavenworth Federal Prison in Kansas, he died of cancer there in 1957, and was buried in the prison cemetery. Alphonse Capone was eventually put on trial in 1931, but not for murder. The charge was tax evasion, and he received eleven years. Dementia brought on by the syphilis he had contracted years before would get his early release for health reasons, and he spent the remainder of his life at his Palm Island estate in Miami. After his death he was buried in Mount Carmel Cemetery, Chicago, near the fellow mobsters he had known and had killed. Asbury, Herbert. The Gangs of Chicago: An Informal History of the Chicago Underworld. New York: Alfred A. Knoff, 1940. Helmer, William J. and Bilek, Arthur J. The St. Valentine's Day Massacre: The Untold Story of the Gangland Bloodbath That Brought Down Al Capone. Nashville, Tennessee; Cumberland House, 2004. Lashly, Arthur V. Illinois Crime Survey. Chicago: Illinois Association for Criminal Justice and the Chicago Crime Commission, 1929. Johnson, Curt and R. Craig Sautter. The Wicked City: Chicago from Kenna to Capone. New York: Da Capo Press, 1998. Parr, Amanda Jayne. The True and Complete Story of Machine Gun Jack McGurn: Chief Bodyguard and Hit Man to Chicago's Most Infamous Crime Czar Al Capone and Mastermind of the S. Valentine's Day Massacre. Leicester: Troubador Publishing Ltd., 2005. United States. Congress. Senate. Committee on Governmental Affairs. Permanent Subcommittee on Investigation. Organized Crime: 25 Years After Valachi : Hearings Before the Permanent Subcommittee on Investigation. 1988. This page has been accessed 13,467 times.